Lightly salt and pepper the salmon. Combine the above ingredients and pour the marinade over the fish. Refrigerate the salmon in the marinade (flesh side down) for 30 minutes, no longer. Wrap in aluminum foil and grill to your liking. Serves 6-8. Melt the butter in a large frying pan. Season the salmon fillets and cook for 6 minutes, turning once. Transfer to a warm plate, cover and keep hot. Add the chopped scallions and cucumber to the butter remaining in the pan. Cook over a gentle heat, stirring, until soft but not colored. Put the cornstarch in a cup and stir in about 2 tbsp. of the cream to make a thin paste. Add the remaining cream to the pan. Stir in the cornstarch paste and the sherry. Heat, stirring constantly, until the mixture thickens. Stir in the chopped basil. Add the chopped tomato with a little salt and pepper, to taste. Stir until the sauce is thoroughly combined. Place the salmon fillets on warmed serving plates. Spoon the sauce over and serve the fish with boiled new potatoes and green beans. Serves 4. Toast pecans on a baking sheet in a 350 degree oven for 8 minutes, until slightly browned. In a saucepan over medium-high heat, stir together half of the butter and all of the honey. Stir in the pecans and cook for 8 minutes, remove from heat, and keep warm. Melt the rest of the butter with the oil in a large frying pan on high heat. Sprinkle fish with salt and pepper and place in the pan. Cook 4 to 5 minutes on each side, until firm and flaking easily with a fork. Place on plates and spoon glaze over top. Serves 8. Mix all ingredients (except the bag) in a glass bowl. The color should be "salmon". Adjust the mayo/mustard/catsup to obtain this color. Place the salmon on single layer of a brown grocery bag and trim around the salmon. Spread the mixture liberally on the salmon. Place the salmon on a hot grill with the lid closed (bag side down) and cook until done to taste. Remove from the grill, remove the brown bag and place the salmon on a serving tray. The concept here is that the bag keeps the salmon moist and the bottom side of the salmon doesn't burn (the bag doesn't burn either). If folks are nervous about grilling or the brown bag, this recipe works great in the oven @ 325 degrees and then a slight broil just before done. This creates a light brown finish to the topping. Excellent! Marinate 1 or 2 hours in above ingredients. Place salmon skin side down on foil. Cook over barbeque, broil, or bake at 425 degrees 1/2 hour approximately, until fish flakes. Combine sugar, mustard, cognac, and garlic. Allow to steep 10 to 20 minutes in blender. Turn blender on whip and add oil slowly. Pour out and mix in the dill. Chill and use as a marinade for salmon or a dressing on lox or cooked fish. 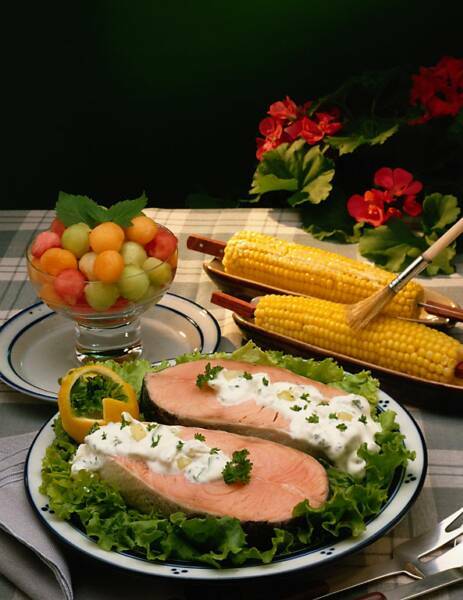 Place a side filet of fresh salmon on an aluminum tray or self-made tray out of foil. Sprinkle with Lipton Onion Soup mix. Let set for about 15 minutes, allowing the salmon's juices time to penetrate the dry onion soup mix. In sauce pan melt butter. Pour in the melted butter a cup of dry vermouth and pour over the salmon just before placing the salmon on the barbeque. In a small bowl, combine miso and tamari until smooth. Place salmon on a plate and coat with miso mixture; cover and refrigerate 1 hour. In a small saucepan, cover garlic with cold water. Bring to a boil, and pour off water. Cover with cold water again and bring to a boil. Reduce heat to low and simmer until garlic is tender, about 10 minutes; drain and set aside. Bring a large saucepan of water to a boil. Add edamame; reduce heat and simmer 3 1/2 minutes; drain. In a food processor, combine edamame, tofu and garlic. Process until smooth. With motor running, pour in broth. Add lemon juice, salt and pepper; process to combine. Pour sauce into a saucepan; warm over low heat. In a large nonstick skillet, heat oil over medium-high heat. Add salmon fillets and reduce heat to medium. Cook salmon until well browned and just cooked through, 3 to 4 minutes per side; serve with edamame sauce. Place salmon on rack in large kettle. Combine rest of ingredients. Pour over fish. Cover & simmer over low heat until done - about 45 minutes. Lift fish out carefully; remove skin. Serve hot or well chilled. Top with Tarragon Sauce. Put lemon pepper on both sides of salmon filets and dredge in bread crumbs. Fry in olive oil and butter about 1/2 & 1/2 of each. Fry until golden brown but do not overcook. Add capers, about a tsp per filet, add lemon juice and cover for about two minutes. Remove filets and keep covered to keep them warm. Cook Pasta al dente and add to pan you cooked filets in. Toss enough to coat pasta. Add fresh chopped parsley and serve with salmon. Serve with a crisp chardonnay wine and French bread. Mix all ingredients and soak fillets for 8 hours. Heat the barbeque grill and grease or spray with Pam. Put salmon fillets meat side down and cook 4 1/2 minutes. Turn skin side down and cook 4 1/2 minutes or until fish is flaky. In a microwave-safe bowl, combine butter and preserves. Cover and microwave on high for about 45-60 seconds, until butter is melted. Stir well to combine. Stir in lime juice, garlic, and mustard. Cool. Set aside 1 cup for basting and serving. Place salmon fillets in a large resealable plastic bag, add 1 cup of the peach mixture. Turn to coat. Marinate for 20 minutes. Drain and discard the marinade from the salmon fillets. Coat a cold grill rack with nonstick cooking spray. Place fillet on the cold grill rack. Grill, covered, over medium heat for 5 minutes. Spoon half of the reserved peach mixture over salmon. Grill about 10-15 minutes longer, depending on thickness of the fillets, just until the salmon flakes easily with a fork. Baste frequently with marinade. Serve on a warm platter and garnish with fresh peaches and any left over marinade. Mix all ingredients: yogurt, mayonnaise, soy sauce, and chopped green onions together. Spread mixture onto Salmon reserving 1/4 cup for "dipping garnish." Either Grill or Broil fish until done (if broiling, do not put the fish too close to the broiler - you will burn the chopped onions). This sauce is also a wonderful alternative to butter on steamed broccoli or asparagus too. Cut the salmon fillet into strips 3x6". Lay in glass baking dish. Lightly salt & pepper approximately 30 minutes before baking. Add can of peaches over salmon just before baking. Pre-heat oven to 400 degrees. Cover dish with foil. Bake for 10-20 minutes, depending upon the thickness of the salmon. Do not overcook. The most important part of any salmon recipe is the cooking time. Begin checking the salmon after 8 minutes. Once the flesh layers easily break apart with a fork, and you can see the white omega-3 fat cooking out of the salmon, remove the dish. Remember to remove slightly before it is finished cooking to the center of the thickest portion, because the fish will continue to cook in the pan once it is removed from the oven. Transfer to a serving platter to avoid overcooking. Serve with rice and steamed vegetables (or many other side dishes) for a great tasting and healthy meal. Prepare grill (use medium heat if using gas grill). Spread butter evenly on fillets. Sprinkle with cinnamon and basil. Grill skin side down for 7-9 min. While grilling combine blackberries and sugar in food processor or blender and puree. Serve sauce over fillets. Heat oven to 375. Grease pie plate (10 x 1-1/2 in deep). Place salmon, cheese, onions, and chives in pie plate. Beat milk, Bisquick, eggs and salt for 15 seconds in blender. Pour over ingredients in pie plate and bake until toothpick comes out clean. (35 to 40 min.) Cool 5 minutes before slicing. Flake salmon, if canned you will want to leave the bones in and mash them thoroughly with your fingers add the rest of the Ingredients. Place in a buttered glass loaf pan. Bake at 350 degrees for 30 minutes. Serve with salad or hot vegetable. Approx 4 servings. Substitute: butter with olive oil and use cooking spray in loaf pan. This simple and easy to prepare recipe works for individual filets or for whole fish. If thicker than 1-1/2 inches adjust timing and add more ingredients to the sauce. Place salmon in foil covered baking pan. Mix soy sauce and spice thoroughly. Coat both sides of salmon. Pour any remaining sauce over salmon. Turn on broiler. Let oven heat for 2-3 minutes. Place pan in middle of oven. Cook for 7-8 minutes. Do not turn salmon. Raise pan to top broiler level. Broil for additional 3 minutes. Watch to avoid burning salmon but be sure that salmon is partially charred. Wrap in Foil and bake at 350-400 for 15-20 minutes (check often so that you don't overcook). On the grill - cook slowly on low heat for 20 minutes (check often). Serve with grilled asparagus and wine - YUMMY! Place the salmon in a large pan skin side down, Sprinkle Johnny's Seafood Seasoning Salt all over the salmon, pour the Budweiser beer over the salmon covering it completely (I have tried several kinds of beers and Bud seems to bring out the best flavor). The salt and beer will start a foaming action and soak for 4 - 6 hours. Get the BBQ HOT and cook the salmon skin side down. Place onions over the salmon, pour the melted butter on, cover with foil, and close the lid. You are ready to eat (10-15 minutes depending on how thick the salmon is or how well done you like it) when you can take a spatula and place it between the skin and filet removing it from the skin. Do not turn over and watch for flair ups from the butter and oils of the salmon while cooking. Sever with lemon and tarter sauce if you so choose, enjoy! Mix marinade ingredients together thoroughly. Place salmon in gallon ziploc bag. Add marinade. Close bag, squeezing out as much air as possible. Marinate salmon in refrigerator for 1-6 hours, turning occasionally. To cook, prepare grill to medium heat. 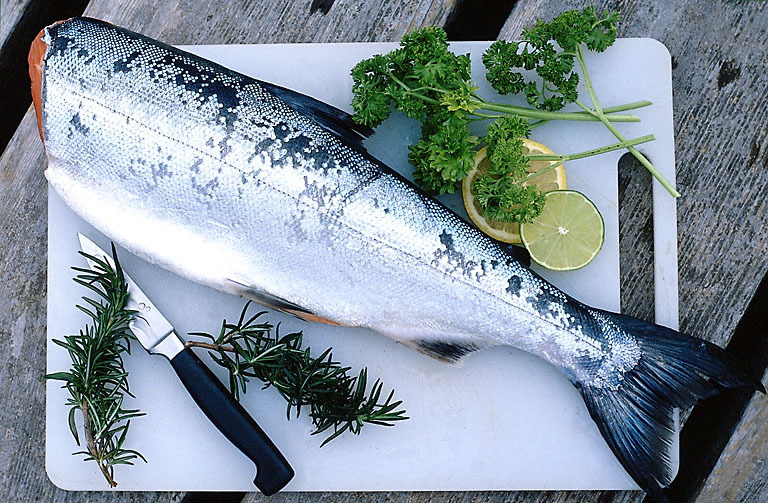 Place salmon in fish basket that has been sprayed with non-stick spray. Place skin side down over coals. Cover grill. Cook 10 minutes, then turn over for 2-3 minutes. While salmon is cooking, strain out garlic and ginger from marinade and pour marinade into a small sauce pan. Bring to boil, then reduce heat to low simmer. Mix cornstarch with small amount of warm water. Add a little at a time to marinade, whisking to prevent lumps. Wait a minute or so between each tablespoon to allow thickening. When mixture is medium thickness (like good gravy), remove from heat. Serve salmon immediately, with sauce on top. Enjoy! Preheat your barbecue grill. Spray a skillet with cooking spray, add the olive oil and heat to medium. Saute the apple and onion slices until soft and slightly golden, adding more oil or cooking spray if needed to prevent sticking. Stir in the white wine and simmer until almost all the liquid is gone. Remove the apple and onion slices from the skillet and set aside. Place the salmon fillets, skin side down, on heavy aluminum foil and arrange the lime slices on top of the fillets. Loosely close the foil around the salmon and place on the grill. Grill the salmon until it begins to flake when tested with a fork. Remove the lime slices and spoon the apple and onion slices over the salmon. Partly close the foil packet again and continue to cook until the apple and onion slices are heated through, and by then the salmon should be fully cooked. Using a spatula, separate the salmon from its skin and transfer to plates, served with the apple and onion slices on top. Instead of using aluminum foil, cook the salmon on pre-soaked cedar grilling planks for a special Pacific Northwest touch. Preheat grill to medium-high heat. Using aluminum foil, create an oblong cooking tray (approximately 13 inches by 8 inches by 2 inches) to be placed directly on grill. Place salmon fillet in center of tray. Season first with garlic salt, sprinkle with brown sugar, and then cover with pieces of butter. Top with sliced red onions. Pour beer of choice into tray to just below the highest point of the fillet. Cover tray with aluminum foil to envelope fish completely. Place tray on grill, cover with lid, and grill for approximately 8 minutes or until just cooked through. Spread mixture over 2 salmon fillets (1 1/2 pounds). Spray pan with Pam. Bake at 350 degrees for approximately 40 minutes or until sauce is bubbly. Serves 4 people. Coat salmon on all exposed edges with pesto or grainy mustard. Bake at 350 degrees for 10 minutes per inch of thickness. Or place on medium heat charcoal or gas grill for about the same timing. Salt and pepper as needed at the table. Pesto and mustard coat the exterior of the salmon so the fish oil and flavor is sealed inside, creating a moist and delicious finished fish. Undercooking is better than overcooking. Mix all ingredients in a microwave-proof dish. Microwave for 30 seconds and then stir. Continue until the orange marmalade has dissolved into the soy sauce. This takes about 2 minutes total. Let it cool. Line a 9x13 pan with foil; spray with nonstick cooking spray. Place a large salmon fillet in the prepared pan. When the glaze is cooled, brush it over the fillet. The fillet may be marinated in the refrigerator for 30 minutes to 1 hour if desired. Preheat the oven to 300 degrees. Bake for about 10-15 minutes until the fish is opaque. The marinade can be brushed onto the fish as it cooks to enhance the flavor. This is excellent served with Florentine rice, tossed greens with a light vinaigrette, and of course, good wine. Place the salmon on a plate. Season the flesh side of the salmon with the seasoning and rosemary sprigs. Place the soaked plank over Direct High heat in barbeque until the edges start to smoke and char, 5 to 10 minutes. Move the plank over Indirect High heat and place the salmon, skin side down, on the plank. Grill until the salmon is just opaque in the thickest part and brown on the edges, 20 to 25 minutes. Remove the plank and salmon to a heatproof surface. Serve warm. Put together the top 7 items and bring to a boil. Place salmon atop the carrots, celery, & onion, and bring back to a boil. Boil for 2 to 3 minutes than turn heat off. Steam for about 10 minutes. Make the lemon mint butter sauce either in microwave or on the stovetop. Place fish on plate and spoon over lemon mint butter sauce. Wash the fillet in cold water, pat dry with paper towel. Place the fillet in ziploc plastic bag. Add the soy sauce, maple syrup and optional ingredients. Seal the bag & mush around so the fillet is well coated. Marinate in the refrigerator for 1-3 hours depending on your desires. 1 hour is still fairly subtle, 3 hours is almost dessert. Barbeque on covered grill until done - will get a beautiful glaze. I like to cut a few small branches off the apple tree and place on the coals. My son, who doesn't eat fish, will ask for 3rds and 4ths on this one. Don't let the amount of onions in this succulent, simple one-dish recipe scare you off. It's never failed to garner raves in the 10 years I've been serving it. Add a crusty loaf of sourdough and a green salad for a memorable meal. 4 servings. Preheat oven to 400 degrees F. Sprinkle fish with 1 tablespoon lemon juice. Set aside. Combine potatoes, carrots, leeks, onions and shallots in heavy 9x13 baking dish, preferably enameled cast iron. Drizzle with olive oil; stir to blend. Sprinkle with salt and pepper. Bake until potatoes are tender, stirring twice, about 30 minutes. Stir asparagus into vegetables. Bake an additional 5 minutes. Remove dish from oven. Sprinkle vegetables with remaining two tablespoons lemon juice and two tablespoons chives and stir gently. Arrange fish in pan, pushing veggies to the side and spooning leeks, onion and shallots over salmon. Bake until fish is cooked through, about 10 minutes. Sprinkle with remaining 2 tablespoons chives and serve promptly. Put on cookie sheet (skin down) and spread mayonnaise over the top liberally. Sprinkle with salt and pepper and bake at 350 degrees for about 45 minutes. That's it - enjoy. Prefer to use fresh, but thawed frozen is okay. Wash steaks. Combine remaining ingredients except lemon wedges. Marinate steaks in mixture for at least an hour. Broil 10 to 12 minutes, turning once and basting with marinade frequently while broiling. These steaks can be done as above but are best done on an outside grill. Cook about 4 inches from moderately hot coals or propane flame for 8 minutes. Baste with sauce. Turn and cook for 7 to 10 minutes longer or until fish flakes easily when tested with a fork. Serve with lemon wedges. Combine first 5 ingredients in a bowl. Brush mixture over fish. 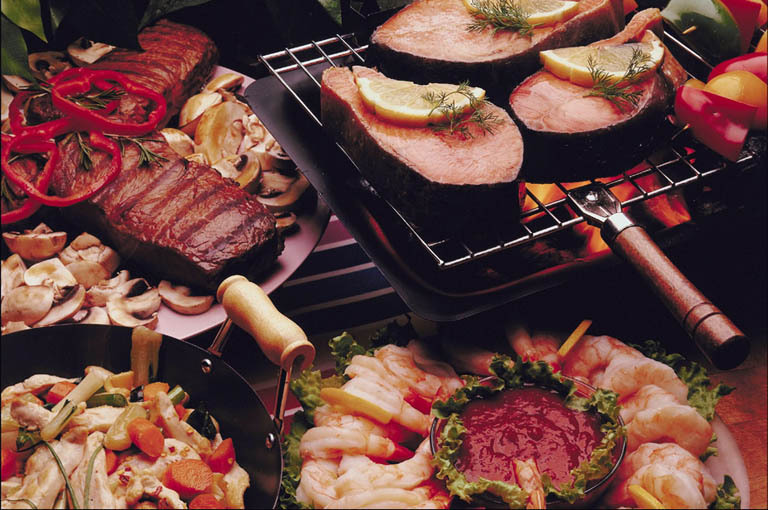 Coat grill with cooking spray and place on Barbeque over medium-hot coals. Place fish on grill and cover. Cook fish 2 to 3 minutes on each side or until fish flakes easily. Mix all dry ingredients; coat each side of salmon fillets with mixture. Heat 2 tablespoons canola oil in large heavy pan over med-high heat. Carefully place salmon fillet in pan. Cook to sear (approx. 2 minutes), turn fillets over. Reduce heat to medium; continue cooking 6-8 minutes. Serve with hot or Dijon-style mustard if desired. Combine all ingredients except salmon in a bowl. In a sprayed 9x13 baking pan, ladle some sauce to cover the bottom of the pan, lay in the salmon (can be cut to fit evenly in the pan) season the salmon with salt, pepper, and garlic powder if desired. Pour over the remaining sauce. Can be prepared, and refrigerated at this point until ready to bake. Bake in a 375 degree oven for 45 minutes until bubbly all over. 1 cedar plank soaked in a container of water for a min of 45 minutes - I prefer the thin shingle types used on houses for siding but you can buy the planks at the grocery. Lemon pepper and sea salt. In the glass pan mix Chardonnay and lemon juice together and place fillet skin side up in the mixture. Let stand at room temp for at least 30 minutes (remember to have your cedar plank soaking in water). Remove from glass pan and discard the mixture. Place fillet back in pan skin side down and sprinkle with lemon pepper and sea salt to taste. Pre-heat gas grill or charcoal grill to medium high; 475-500 degrees is excellent. Place cedar plank on grill and slip the fillet on the center of the plank. Note, after a few minutes the plank will begin smoking. Cook for 10-15 minutes depending on the thickness of the fillet, checking for doneness by looking for the change of color from red to pink. Salmon is best if not overcooked. When done, remove from plank by slipping two spatulas under the fillet and gently lifting onto serving platter. Garnish with fresh parsley and lemon wedges. Goes extremely well with wild rice or Pasta Alfredo along with your favorite Chardonnay or Oregon Pinot. Place salmon filets in pan, add orange juice to cover; turn filets to soak orange juice into flesh of salmon. Leave filets in orange juice for 15 minutes. Remove filets and pat dry. Place filets in hot oil (on high) flesh side down until browned. Remove salmon from stove and place in preheated oven at 400 degrees for 5-7 minutes or until flesh is no longer translucent. Meanwhile: mix orange juice from pan with honey and cumin. Beat together until emulsified. Remove salmon to warmed platter; pour orange juice mixture slowly over filets to let glaze absorb into salmon. Serve with garlic mashed potatoes, good bread, a big green salad and a light red wine. Serves 4. Mix breadcrumbs and all the seasonings. Place bacon in hot skillet and fry 'til crisp. Drain on paper towel. Add butter to skillet and saute onion, celery, and apples, just until they become soft. Add those, including any liquid in pan, to the breadcrumb mixture, then add the bacon and almonds, toss all together lightly with a fork. Stuff the Salmon with the mixture, (saving a little for the baking pan).Place a sheet of aluminum foil in baking pan, Place a bay leaf and a few slices of bacon and onion on paper, and lay fish on top. Bake in a very hot oven, 500 degrees for 10 min. ; then reduce heat to 425 and bake 20-35 min. longer. (Allow 10 min. per pound, for the first pound, then 5 min. for each additional pound.) Serve with tartar sauce. Thaw fish, place single layer in shallow pan. Combine ingredients & pour over fish. Let stand 30 min. Remove fish, broil or barbecue & brush with sauce. Turn fish & brush again. Double marinade for large fish. For Baking: Line a 15 x10x1-in. baking pan with heavy-duty foil; grease lightly. Place salmon skin side down on foil. Dribble lemon juice over salmon. Sprinkle with lemon-pepper and onion salt. Top with lemon slices and onion rings. Dot with butter. Fold foil around salmon; seal tightly. Bake at 350 degrees for 20 minutes. Open foil. Broil 4-6 in. from the heat for 8-12 minutes or until the fish flakes easily with a fork. For Grilling: use a 9x14-in. perforated grilling pan. Follow above instructions for seasoning the salmon and seal foil tightly around salmon. Grill the salmon for 15 - 20 minutes on moderate heat. Open foil and continue grilling for 5-9 minutes. Combine the sauce ingredients until smooth. Serve with salmon. Yield: 6 servings. Blend all ingredients in food processor. Scoop to serving plate. Sprinkle chives over salmon paté for an attractive presentation. Spread on water crackers or chips or fancy breads. Thoroughly mix all ingredients except chopped pecans and chill at least 1 hour in a small bowl lined with saran wrap. Remove from bowl and roll into a ball or 2 8x2" logs. Roll in chopped pecans to thoroughly coat. Serve with your favorite crackers. If smoked salmon is not available, use a 14 oz. can of red salmon and 3/4 tsp. liquid smoke. Mix glaze ingredients, and reduce for 1/2 hour. Glaze hot pan, pour enough glaze to coat. Place salmon filets into hot pan till salmon takes on color of glaze, approx. 60 sec. per side. Place salmon into baking dish and bake at 400 oven for 8 min. Pour excess, reduced, crispy goodness of sauce on to each serving. Light 25 charcoal briquettes, or preheat gas grill for 15 minutes. Soak Alder chips (or Hickory). Use pellets for gas grills if possible. Remove pin bones from filets. Season filets before lighting fire. Melt butter, add lemon juice and hot sauce, if using. When fire is ready, use a paper towel to spread the oil on the grill. Put the filets on flesh side down. Add a handful of chips (or pellets if using gas). Cover grill but leave vents half open, and cook fish for 5 minutes. Baste skin side and flip fish, adding more chips. Baste fish and cover grill. Cook for 3 minutes and baste again. Do not allow fire to flame up excessively- Sprinkle with water or other available liquids, like beer. Cover and cook an additional 2 minutes, baste once more and take up. Enjoy. Place fish on foil-lined cookie sheet, skin side down. Pour 1/4 c. lemon juice, salt and garlic powder over fillet. Bake in preheated 375 degree oven until fish flakes when lifted with a spatula at the thickest part. Combine remaining ingredients, warm them, then pour over cooked fillet. Bake for 5-10 minutes, or until sauce bubbles around edges of fish. Garnish with parsley and paprika. 4 Tbs. butter or margarine, divided into 4 "pats"
Tear off 4 strips of heavy duty aluminum foil - each large enough to accommodate salmon steaks and toppings. Place one salmon steak in center of aluminum foil. Place one slice of onion, one slice of lemon and 1 "pat" of butter on top of steak. Sprinkle 1/8 tsp. of lemon pepper on top and finish by sprinkling 1/4 of the packet of dry Alfredo Sauce Mix. Roll aluminum foil and seal edges securely, piercing top of foil 2-3 times with a fork to allow steam to escape. Repeat with remaining salmon steaks and ingredients. Place over hot, grilling coals and cook until salmon is flaky and cooked throughout - 20 to 25 minutes, depending on distance above hot coals. Carefully open foil pouches and serve - the flavor is simply delightful! Serves 4. Mix ingredients together and let sit overnight. Place fish on cookie sheet (no aluminum), and marinate with mix. Let stand 2-3 hours. Place fish on grill at low heat for 10 min, increase heat for 10 min until salmon flesh flakes. Cut the salmon when it is still half frozen in small bite-sized chunks. Beat an egg white and add some lemon pepper and garlic powder. Put some flour in a plastic bag. Dip salmon chunks in egg white, and shake them in flour until they are all covered. Fry them lightly in some olive oil for 10 minutes. Serve with mashed potatoes and green peas mixed with carrots. Mix the salmon with 2 egg whites. Add left over mashed potatoes or add some cornmeal. Make small patties and fry in frying pan lightly covered with olive oil. Mix all above ingredients together (pour into wine bottle or like). On a charcoal BBQ with lid; lay skin side down filet of salmon on the grill. Douse mixture over meat side of fish careful; it will flame up a bit. Cover with lid immediately. Let smoke for 5 minutes. Repeat process until fish is cooked halfway through. Turn fish meat side to the grill; skin will stick to grill. Pour balance of mixture; cover and let stand for 5 more minutes (depending on filet size). Serve and enjoy. Some fresh squeezed lemon, a bit of crushed garlic, and a dash of salt and pepper grilled or broiled. Or, if you get 20 lbs at your doorstep, you are certainly going to freeze some. If your thawed salmon is a bit dry, mix up a spread of mayonnaise, garlic, lemon, salt and pepper, wrap the filet in foil loosely (like a pocket or pouch) and bake at 425 for 20 minutes. (This sort of steams or poaches the salmon in the foil bag.) MMMMMM! Brush the mixture on top of salmon and sprinkle fresh dill on top of fillet. Preheat grill and place salmon fillet skin side down and cook approximately 18-20 minutes over medium heat. Do not move the salmon while cooking and the skin may peel off when you remove it from the grill. 1/4 cup minced fresh herbs-opt. Place the fillet skin side down on a large piece of plastic wrap. Pull out any thin bones you can feel in the fish when you run your hands down the side. In a small bowl, combine the salt and sugar. Rub the seasoning evenly over both sides of the fish. Wrap the fish in plastic wrap and then in tin foil like package. Refrigerate for 12 hours or overnight, turning the package at least once. Weigh down the package with brick or other heavy weight. Unwrap the fillet and rinse under cold water; pat dry. Place skin side down on a large piece of plastic wrap. Drizzle cognac over the fish and rub into both sides of the fillet. Unwrap a spice grinder, blender, or mortar and pestle; coarsely grind the black and white peppercorns, allspice berries and coriander seeds. Rub the pepper seasoning over both sides of the fish. Wrap tightly in plastic wrap and again in aluminum foil. Sandwich the fillet between two small cookie sheets or flat platters, and again put a 2-3 lb. weight on top. Refrigerate for at least 6 hours or overnight to let the flavorings penetrate the fish. To serve, unwrap and scrape off some of the pepper seasoning with the back of a knife. With a long, narrow slicing knife held parallel to the fish, slice the fillet about 1/8 inch thick. Divide the slices evenly among 4 plates. Sprinkle with the herbs and shallot, if desired. Garnish with lemon. Simply make up a bottle of Good Seasons Italian dressing and pour this over your salmon. Then bake or BBQ as you normally would and as long as you don't overcook it, it will be the best salmon you've ever tasted! Prepare outdoor grill for high heat. Trim the tail and fins off of the salmon. Make several shallow cuts across the salmon's skin. Place salmon on 3 large, slightly overlapping sheets of aluminum foul. In a bowl, stir together soy sauce, chile sauce, ginger, and garlic. Mix in lime juice, lime zest, and brown sugar. Spoon sauce over the salmon. Fold the foil over the salmon and crimp the edges to seal. If using hot coals, move them to one side of grill. Place the fish on the side of the grill that does not have coals directly underneath it and close the lid. If using a gas grill (coals are the best) place the fish on one side, and turn off the flames directly underneath it, close the lid. Cook for 25 to 30 min. Remove to a serving plate and pour any juices that may have collected in the foil over the top of the fish. Sprinkle with green onions. Fresh Hand Picked Corn is a Delicacy in Alaska. With all of the Salmon you are going to catch while Fishing with Alaska's Kenai Peninsula Fishing you should be able to try them out more than once. Make sure you hall up your Ice Chest Full of Corn. !FISH ON! IT'S WAY TO THE GRILL!